People text now more than ever. Think you're being left out of the conversation? 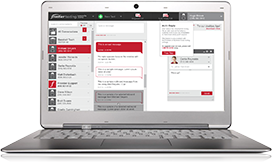 With Frontier Texting, you can use your existing landline phone number to start, take part in and stay up-to-date on important text conversations. So if you're a business with a landline, or homeowner without a cell phone, you no longer have to worry about missing out. Don't miss out on another conversation. Communicate with customers or friends and family the way they want - via text. Send and receive texts directly from your computer. No additional equipment necessary. Choose a plan that works with your budget. Select an option below to learn more about plan features, rates and more. Use your business phone number to text and stay in touch with customers. For a low monthly price you can schedule appointments, confirm meetings, take or place orders, and more, all via text message. Those you love are texting, and you should be too. Keep in touch by sending and receiving text messages through your home phone number. No cell phone plan required. Available for a low monthly price. Frontier Texting service requires a Frontier voice plan. A one-time activation fee applies. Frontier reserves the right to withdraw this offer at any time. Taxes, fees and other restrictions apply. © 2015 Frontier Communications Corporation.